People think that just because it’s summer, you can’t get a cold. What people don’t realize is that catching a cold doesn’t really have anything to do with cold temperature as much as it does about having a healthy immune system and being around other people. During the summer, most of us are out running around breathing fresh air. During the colder months, we condense into rooms, breathing the same circulated air over and over. (Blech!) Fortunately, products like Cold-EEZE can help us fight any cold systems and keeps us going – summer or winter, rain or shine. 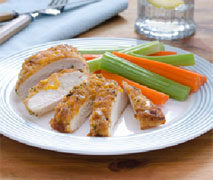 Cold-EEZE is the best thing to keep on hand to help stave off any cold symptoms. Cold-EEZE is a cold remedy family of lozenges clinically proven to significantly reduce the severity and duration of the common cold. Cold-EEZE contains zinc gluconate glycine which scientists believe attacks the cold virus and blocks it from permeating the mucous membranes. Cold-EEZE lozenges and sugar free tablets are available in a variety of great tasting flavors. Cold-EEZE is approved for people over the age of 12. Although we here in Texas just broke a 41-day streak of 100+ degree weather, summer colds are still not uncommon here. Since no one was currently fighting a cold, we decided to let SuperDad try a lozenge to let us know what he thought due to the fact that he would probably be using them most. He was a good sport about it and seemed to enjoy the Honey Lemon Flavored lozenges which smelled sweet and were “pretty tasty.” For those of us who aren’t as fond of taking medicine, Cold-EEZE makes it easier by offering a variety of non-mediciney flavors, including Mint Frost, Tropical Orange, and Strawberries & Cream. They also have sugar-free varieties for those who need to watch their sugar-intake. Not only did SuperDad mention the pleasant flavor, but he noticed that taking the lozenge did not leave him feeling dizzy or drowsy afterwards. He was able to go on with his evening without any effects of the medicine – another plus for this #1 pharmacist-recommended zinc cold remedy. 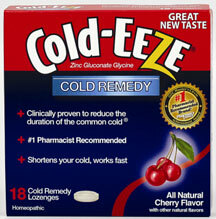 Cold-EEZE is made for taking at the first sign of a cold and can be taken until symptoms resolve. “The earlier, the better.” The main ingredient, zinc gluconate, is believed to help prevent the cold virus from reproducing, which helps you get better, quicker. For more information about Cold-EEZE and how it helps you get well sooner, you can download a free e-book from their website. If you have kids 6 years or older, you can also check out Kids-EEZE, an over-the-counter, soft-chew that can help relieve cold and allergy symptoms. Kids-EEZE is available in kid-friendly Grape and Strawberry flavors and since it’s a chew, you don’t need to worry about pouring or measuring, making it convenient while you’re on-the-go. I would recommend these homeopathic lozenges to my family and friends… as well as you! When the winter weather finally sets in and cold season arrives, we will be well prepared with Cold-EEZE! Disclaimer: This post consists of my (and/or fellow tester) opinions only. Your experiences may be different. No compensation was given for this review/giveaway. Staci did receive a free product from the manufacturer or their representing PR agency to use and test for the purposes of this review. This did not affect the outcome of this review. love and rely on cold-eeze! highly recommend! Awesome! Love to know that other people are fans too. What’s your favorite flavor? I’m usually a cherry person, but the mint is good, too. I think I would like the lemon. The trick is to start taking it the minute you feel a cold coming on–those first three days are key to it getting stopped. But, if you’re a little late, don’t worry, it really does lessen the symptoms and duration. Unfortunately for all of you who seem to love this product, homeopathic remedies do not contain any medicine. They are water diluted so much that there is no realistic way that even one molecule of the original substance remains in the medicine. This is how homeopathy works. SuperDad didn’t get dizzy or drowsy because he didn’t actually ingest any chemical other than H2O and whatever neutral substance (usually lactose, or milk sugar) they apply it to. I’m very sorry if this disappoints you all. Do your own research into homeopathy… it is a totally discredited medical “theory” invented in 1795, before doctors even knew what germs were. Every single one of the major laws or “rules” of homeopathic preparations sound ridiculous to anyone with a passing knowledge of chemistry. I don’t say this to be mean, or snotty, or to make myself out to be smarter than you. I say it because you’re being fooled by advertising and hokum into spending $30-$60 dollars for a bottle of sugar and water, and I think it’s despicable for people to take advantage of you like that.